Jeff, I gotta disagree with you there. If he’s aiming for an “eternal” record, then he’s got it right. Nothing we’ve come up with, from paper to digital media, CDs and DVDs can come CLOSE to the staying power of stone. You try finding good quality 5-thousand-year-old Chinese paper or a 10-year-old Hard Disk in working order. Now, try finding good quality 5-thousand-year-old Egyptian stone carvings. See the difference? Now that aint good. How is a man going to wipe himself properly with a 9ft stone plate? Im guessing hard drives and cd roms aren’t better at it either. Chinese 5000 year old paper…now that’s some proper way to go! Wise guy this Egyptian…he doesn’t look like mage Egyptian. He looks more like a drunk celt Druid to me. 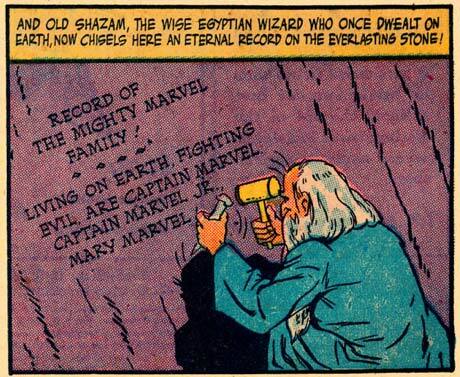 Writing Marvel, Marvel…he could have used ____II____ instead and sum up all of the inglorius bastards. He has to write it down. He’s suffering from magic alzheimer’s.